Schwartz, a father of nine, ran towards 46th Street, but he tripped and Afzal caught up to him and once again began to beat him mercilessly. Fortunately, a passerby approached to stop the attack, and Afzal went after him. Police said it was that distraction that likely saved Schwartz. Witnesses kept the driver at the scene until cops arrived and arrested him. Police later told CBS2’s Hazel Sanchez that Afzal may have mistaken Schwartz for another Hasidic man who allegedly hit his car for no apparent reason while he was stopped at a red light. However, Afzal’s lawyer claims that it was Schwartz punched the window of his client’s car during an alleged argument that started when Afzal honked his horn, frustrated by how long it took the 62-year-old to cross the street. The lawyer claims the two men were yelling at each other, which led to the alleged hitting of the window and ultimately, the assault in the street. On Sunday, NY State Assemblyman Dov Hikind praised the NYPD for the quick arrest. On Monday, however, Hikind slammed those trying to “mischaracterize” the attack as anything but a vicious hate crime. Schwartz’s family and many in the Boro Park community are angered at the prosecutor’s decision to drop hate charges against Afzal. “wild west” is the wrong analogy .”Boro Park isn’t a Arab country “would be the better analogy. Church Car Service seems to be a well used service I am not suggesting we dont use them. However they need to make a commitment to our community as to the drivers they will be employing in the future. It is unfortunate that he was attacked, at the same time, If he got attacked for being a jew, he should be happy. I have heard years ago that if you get attacked for being a jew, there is no doubt about your being a yid. Hate crime charges were NOT filed. It was arab against Jew and calls of allah which makes it holy and not hate! Welcome to deblasio’s NY in 2018. This is type of Muslim garbage president Trump wants to protect us from. I cant c clips because of my filter but on the still photo of news report screen it says”62 year old jewish man brutally beaten on brooklyn street after an argument” Is someone on top of that(maybe dov hikind) for a correction by whichever fake news station that is? B’H he was not seriously injured and hopefully the DA’s office will prosecute this animal vigorously for the attack. 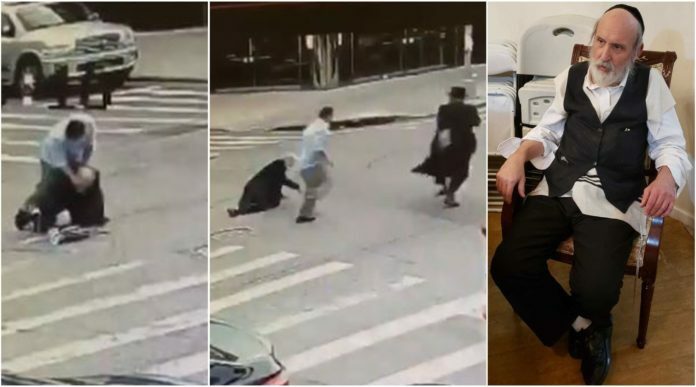 I do question though the wisdom of posting a video on the internet showing the victim of a traumatic assault dancing in shul with his chevrah immediately after the attack . Yidden may understand the context but the visuals can easily be missued by the defense attorneys. Perhaps in this situation, benching gomel would have been sufficient. Police later told CBS2’s Hazel Sanchez that Afzal had mistaken Schwartz for another Hasidic man who had hit his car for no apparent reason while he was stopped at a red light. If this is true then it wasn’t a hate crime. If you watch the video, this horrible animal also attacked a second religious Jew — who the animal did not confuse with some driver of another car — or whatever his false story was — so it was indeed a hate crime. Thank g-d this wonderful Jew is well enough to continue his routine. I hope the animal gets a long prison sentence with a terrible cellmate. There are a lot of people praising Allah in prison — so he will feel at home. If you see a red light, start slowing down immediately. DO NOT CONTINUE TO DRIVE AT THE SAME SPEED AND THEN SLAM ON THE BRAKES. Last week the charges were dropped for the guy beaten by ana”sh in Willy. What goes around…. Yesterday in Crown Heights an animal, who was just released 20 mins BEFORE for robbing a bodega, beat a Yid with a stick, hard enough the tree branch broke! BH he was caught. Do you think HE will be charged properly? 1. It is usually easier to prove asault than “hate”, and if the prosecutor argues “hate” and fails to convince the jury, it increases the liklihood the jury will acquit on all charges. 2. Given the “blue wave” in New York City politics, we can expect greater tolerance of anti-semitism, since that is the politically correct thing to do. I am among the believers that this is the impact of our anti-Jewish mayor who sucked up to Jewish voters to get into office, but has since shown his true colors. As for a remedy to fix the situation, I can reminisce to the days when there was a “chaptzem” system, when such thugs were guaranteed to never walk again. Do we need to resurrect a JDL that patrols and protects our population? Or would this make the mayor’s office even more rabidly anti-Semitic? It is clear that law enforcement and court are unlikely to do a satisfactory job of insuring our safety. This is outrageous. This Muslim “prophet” beat up a Hasidic looking man becuase of his religion. The “road rage” fallacy can be disproven by reviewing the cameras. The car was speeding down 13th avenue and blew the red light. In contrast, when a few Shomrim members in Williamsburg decided to play cops-and-robbers and the victim happened to be gay, the prosecutors – despite prosecutorial misconduct and a lack of evidence – charged the Shomrim member with a hate crime. The message is clear: Beat up a Jew and you won’t be charged with a hate crime; beat up someone who may be gay (or any other protected class) and you’re charged with a hate crime. Perhaps, in liberal New York, next time a Jew is beat up he should claim to be gay (or Muslim). Remember, the only time you can be charged with a hate crime is if you attack a Muslim or an African American. Attack a Jew? Eh big deal. Wouldn’t road rage indicate that there was some sort of altercation between the two? Not just the way this animal jumped out of his car to attack an innocent man walking down the street! In any case, whatever the charges are, we should all gather behind the innocent victim and make sure charges are pressed, and the courts see the community is behind him so that no one lets it slip between the cracks letting this guy off easy. will all the self appointed askanim still attend Eric Gonzalez Chanukah party despite him not taking anti-Semitism seriously.? by the way he will be released tomorrow, he is not an Arab but rather Pakistani and he got only $7,000 bail. no hate crime charges, and he is charged with “ATTEMPTED” assault. Someone should investigate whether he still has a driver’s license. Someone like this should not be driving. Come to think of it, I’m not so sure I would consider this a hate crime. However, I would take the Muslim-on-Jew attack as an act of terror, and i would want it prosecuted that way. Home run! Its just a shame that most local yiddilach are blind to this fact. Stop your ignorance. Charges were dropped because there was no evidence connecting him to the crime. This was not a favor. There was no case according to the evidence. Here, there is a noticed departure from the facts. This is some sort of political move, and any DA that does that needs another career. Sounds like you are referring to the case were 5 were charged for allegedly beating a year ago. In that case, as “‘The little I know” pointed out, you are way out of line. The suspect in question was charged but the alleged witness FAILED to pick the suspect in question out of a line-up. The other four remain charged. We also on video Mr. Schwartz’s energetic walk. We also all saw that he didn’t expect a confrontation with the guy, who he thought was running past him. Let’s get the story straight. A pedestrian touches his car, then he has to drive three blocks 50mph to catch up to the pedestrian? Is that the same pedestrian who it took too long to cross the street (during a red light)? So, very clearly, his lawyer made up this story in order to downgrade the charges. I believe that at this point he is supposed to prove his story, since we have witnesses to the contrary.